Just west of the Annapolis Bridge is today's bridge over Haupt Creek. 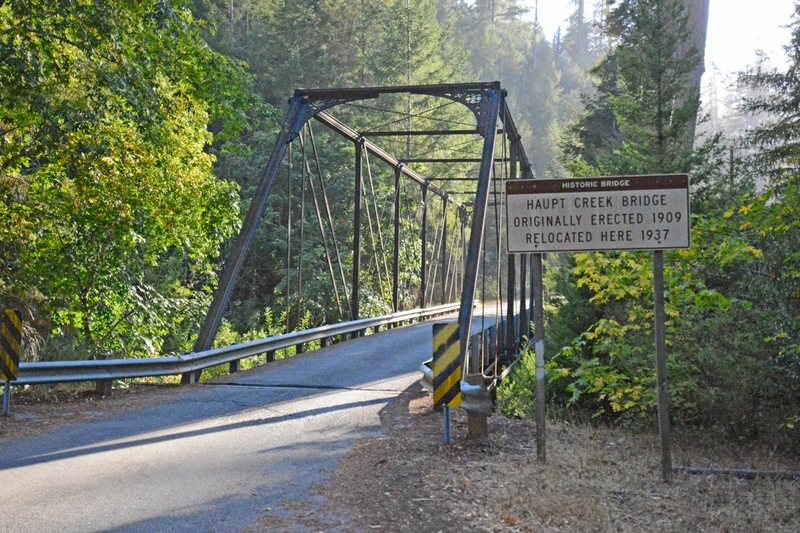 Like the previously studied Geysers Road Bridge, the Skagg Springs Road Bridge (20C0224) over Haupt Creek was originally built somewhere else and later moved to this spot. Its a 134 ft long pinned Pratt through truss with a 13 ft wide deck. The bridge has over 20 ft of vertical clearance and it was built in 1909. Like several other trusses we've recently studied, this bridge has Phoenix columns as compression members. They are composed of four, six, or eight elements that are riveted together. It was patented by Samuel Reeves in 1862 and became a standard element constructed by the Phoenix Bridge Company. Because they are hollow, they allowed the construction of light-weight members and taller structures. Sonoma County, California Bridges: Skagg Springs Road Bridge across Haupt Creek by Mark Yashinsky is licensed under a Creative Commons Attribution-NonCommercial-NoDerivatives 4.0 International License.